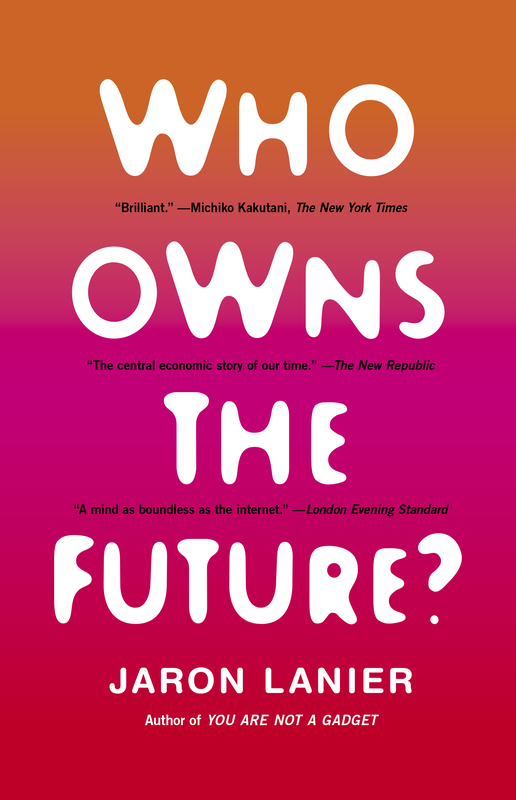 Jaron Lanier’s „Who owns the future?“ is certainly an impressive book. Already published in 2013, it is the perfect book for everyone still not sufficiently depressed by Piketty’s „Capital“ from 2014. Why? Lanier’s main thesis is that the age of digital networks and social media threatens the global middle classes and social inequality is about to rise dramatically. This time it’s not about losing jobs to automation – this time it’s about the growing share of profits and income that goes to those who operate large servers: either servers with smart algorithms that capture consume data – think Facebook, Google, but also any price or insurance comparison site – or servers that collect fees from large numbers of users (think ebay, Airbnb and the like). The risk is that there can only be a handful of winners in this global game: there’s no German or Finnish ebay, there’s just the one ebay. And there will not be a large number of local newspapers (employing well-educated people) but probably just some sites like the Huffington Post, the NY Times or the Guardian, plus one local hero. The music industry has already gone the way of the Dodo (remember when you still shopped for CDs in your neighbourhood, thereby supporting a national eco-system of distributors and salesmen?). Other industries are about to be killed („disrupted“) in the not so distant future: teaching and universities will turn into online classrooms, instead of millions of taxi and lorry drivers we will need just one server coordinating self-driving vehicles, we will have fewer factories (thanks to 3d printers) or healthcare employees (think teledoctors or robotic nurses). Everywhere that software starts to play a bigger role, the middle classes are threatened. Lanier, ever the optimist, also has a remedy: okay, if software and algorithms make money analysing my behaviour, thereby making my profession obsolete or obscenely competitive and less well-paid in the future – then these IT companies should pay for using my input, my data. In other words, people should monetize their data to secure their future income. Every text they publish on Twitter, every shopping decision on priceline.com, every action that is caught on camera and can be digitized, every like on Facebook must be worth something, otherwise the algorithms wouldn’t be interested in the data. It is certainly a novel and charming idea, but it is far too technology- and transaction-driven for my taste. For instance, Lanier discusses a scenario where nurses in health and geriatric care become supplanted by robots. These robots of course have to be programmed using real data about what constitutes „good care-giving“: how does a nurse behave when, for instance, handling a bed pan? Meanwhile, the programming of caregiving robots will be utterly dependent on cloud software that will in turn be dependent on observing millions of situations and outcomes. When a nurse who is particularly good at changing a bedpan feeds data to the clouds – such as a video that can be correlated to improved outcomes, even if the nurse never is told about the correlation – that data might be applied to drive a future generation of caregiving robots so that all patients everywhere can benefit. But will that nurse be compensated? I’m not sure compensating nurses „particularly good at changing a bedpan“ for their mastery is the way to go, just as monetizing my tweets and inconsequential status posts on Facebook strikes me as a silly and unrealistic idea. I appreciate that Lanier is very keen on protecting a person’s income and dignity in the digital age, however he tries to do so by finding something of transactional value for big IT companies and algorithms. It is an innovative idea at first, but it is short-sighted and links personal income with the amount of „data“ people can provide. First of all that will be terribly hard to measure and quantify – who could say what spying on my individual shopping behaviour should be worth to priceline.com? And second, what kind of „income“ would people receive that do not generate lots of data – people that don’t tweet, that don’t perform in front of webcams, or that are just „average“ and not promoting software quality or algorithmic cleverness in any meaningful way? Lanier’s book is very inspiring, but to protect everyone’s dignity in the age of social injustice and digitization, a better, simpler and ultimately more just system has already been conceived: that of the „Basic Income„. Everyone gets paid a basic income (be it 1.000, 2.000 Euros), regardless of his or her „informational value“. A basic income system just assumes that everyone has some kind of value and dignity – as a person, a mother, a father, as someone who walks his dog everyday – and deserves basic security and income – regardless of his value for others or even algorithms. When I remember what Piketty writes about the immense accumulation of wealth in the last 40 years, I also have an idea where the money for that kind of basic income scheme should come from.